Foreword by Tanya Tucker. 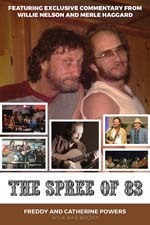 Featuring Exclusive Commentary from Merle Haggard & Willie Nelson. Recorded in Merle Haggards studio. The simple style of Freddy's laid back ballads to the Hot Club of Freddy, you can listen to this album over and over & you'll always hear something new. No big production, just good music. *Shipping and handling charges are included for U.S. Orders. International Orders please add $4.60. Please click the International Shipping Button to add this fee to your order.